The SUNDOWNER Super Tunnel features a full length all fiberglass stringer system, with full flotation and is a true self bailing hull and an underfloor rigging tunnel. The hull design includes a deflector Vee Bow, a "True V", and incorporates 30 degree lifting strakes producing a dry riding boat, as well as eliminating side skidding in turns. This boat provides superior performance, minimum fuel consumption, and reduced horsepower requirements. The hull will obtain speeds approaching 45 MPH, produces a soft and dry ride, has excellent load capacity, and cruises on approximately one gallon of gas per hour. The tunnel design provides very shallow water capabilities, requiring only a few inches of water, approximately 5", this boat has excellent interior room.The ALL Fiberglass construction, including the stringer system has been engineered for long years of flawless performance. 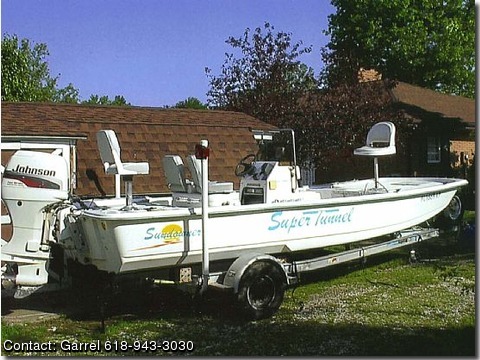 There is a manual for the engine, large front deck, large rear deck with a livewell, large console with seat and storage, stainless steel grab rail, smoke windshield, 15 gallon fuel tank with vent, bilge pump and fuel seperator, hydraulic jack plate to lift the engine vertically, stainless steel prop, 4 cleets and hardware, Magic Tilt aluminum trailer with Buddy Bearings.